Commonly called Fountain Grass, the Karley Rose Pennisetum has dark green foliage topped with long-blooming rosy lavender plumes. This grass is a breathtaking ornamental grass that I have added to my garden. I have two Karley Rose Fountain Grasses, Pennisetum orientale, in the garden, on either side of a green Japanese Maple. As they grow, the texture and pink plumes offset the green lace foliage of the Japanese Maple beautifully. 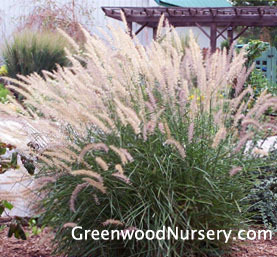 The soft pink plumes on this Ornamental Grass will stay around during the winter and then should be cut off the foliage to 6 inches from the top of the ground in early spring. Strolling in the garden in the fall and early winter, after the grasses turn their great yellow fall color, there is such a calming affect when the slight winter breezes create a gentle rustle in these grasses. Add several fountain grasses to your garden setting and you'll enjoy it all the more in late summer through fall.